Next Funkey! sight-reading books: The winners…. Oh boy I’m the first one to comment! These look to be terrific books-I’d love to try them out! I’d love to try these out, both for me and my students. They look like they make sight reading fun! you reminded me when I first began my music lessons.. The books look great! It would be perfect to have them by every student. These books look great! Would love to see what’s inside and have a go with them! These books look interesting and fun! Would love to check them out! I’m trying Book One of these with my pupils, but am very keen to get my hands on the other two. Really enjoying the book and the play-along cd! These books look as if they could make sight reading a seriously fun activity. No mean feat, Melanie! Love the look of these books! 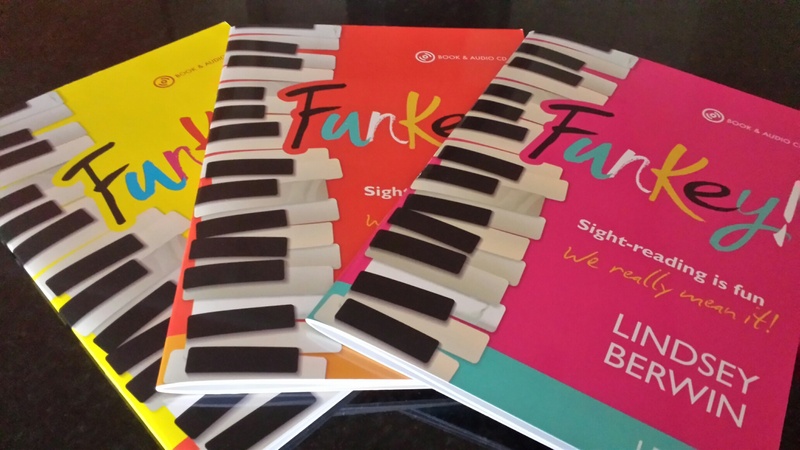 Fun and funky sight reading….just what my students need!! This is wonderful. My students would really benefit from this. I hope to win. These do look interesting. I would love to try these with my students. I’d love to use these! Do they ship to the US? These would be a great addition to my library. There aren’t enough books for sight-reading, and these just look delightful!!! Wow — these look great! Would love to add them to my studio library! When my students forget their books we sightread for the entire lesson. These books would be a blessing to my students and to me. So cool! You can never practice too much! I like these books! I would like to have them. Nice! My students would love this! I really love the idea of backing tracks. Always on the lookout for ways to inspire Sightreading. Sight reading is an area I definitely need a good lively book to help with. This looks great. How fun! I think sight reading is so very important! Any of them would be wonderful! Would you ship to the US??? I want these for my kids!! These books look really unique and interesting! Would love to try them with my students so would be thrilled to win them! I find everything you recommend is great quality and my students love it. These look to be good resources and I certainly would use them. Thank you for your continued quality recommendations. These look like great fun – which is what sightreading should be! Sight reading can seem like a bit of a chore sometimes, with a reputation for rather dull exercises. So it is refreshing to have a new series of books which include a variety of styles and which aim to be fun to play. The title Funkey is a great play on words! I am in! Thank you!! I would love to use these books with my students!!! Please pick me :-). These sound like a great new resource! Just love the look of these! I’m gradually building up my beginner books to look more up to date than the very books I learnt on in the seventies! . These certainly fulfil that brief! sight-reading is one of the top skills that I teach. It’s such a valuable skill-I’d love to have more resources. These books look like they would be really fun! I reall need some sight reading books. I hope I win! I have heard only good things about these books! Crossing my fingers maybe I will win one since the ol’ budget is a bit strapped this year!!! Thanks for doing these contests, such a fun way to learn about new materials. I would love to look at these. I start each lesson with rhythm and sight reading exercises. I already think sightreading is really fun; hopefully these books might get a few more pupils agreeing with me!? These books look great for my students! Woo. Fantastic to use books by local female composers. Intrigued! These giveaways are so fun! Thanks for doing them. I’d love to take a look at anything that helps with sight reading! Thanks, Melanie! Great idea, I’m always looking for more of these resources to encourage my students to be less afraid when sight reading. These look wonderful. Encouraging my students to do more sight-reading. Good sight reading resources are thin on the ground, so having these would be great. Cool covers, proper pieces AND backing tracks?! Awesome – with this my students will not even realise they are doing the dreaded sightreading! Seriously, the backing tracks will be great for getting them to just keep going – my main challenge! A welcome change from exercise-based resources. Can’t wait to take a peek! Sight reading inspiration- its what a lot of students seem to need!!!! Would love to give these a try and maybe stock them in my store!!!! I LOVE sight reading and am always looking for ways to teach my students to be better sight readers. I would love to win! Perfect timing for summer lessons and to explore something new! Winning or not, I may have to get me a set! These books look great 🙂 I love sight reading. In haste. Pupil’s concert today. Yes please! Have so many pupils who would benefit from these books!